Meridians are pathways of energy flowing throughout the body. Each meridian passes through and affects our organs, physiological systems, and emotions. The Meridian System has 12 principal meridians that correspond to the yin and yang organs and the pericardium. Each organ system is in charge of specific physiological functions and correspond to aspects of the body. The Zang Organs are “full” organs and are Yin in Nature, while Fu Organs are the “hollow” organs and are Yang in nature. Yin organs are usually those without an empty cavity, and include the Liver, Heart, Spleen, Lungs, and Kidneys. Yang organs are organs with an empty cavity that include the Gall Bladder, Small Intestine, Stomach, Large Intestine and Bladder. In Chinese viewpoint, Yin and Yang organs are physiological functional units that incorporate a much broader meaning then common Western thinking. In addition to the12 principal meridians, there are eight extra meridians and smaller network-like luo meridians. Among the eight extra meridians, the Governing Vessel and the Conception Vessel are considered the most important channels, because they have acupuncture points independent of the twelve principal meridians. Eight extraordinary meridians:These eight extra meridians are different to the standard twelve organ meridians in that they are considered to be storage vessels or reservoirs of energy and are not associated directly with the Zang Fu or internal organs. This class focuses on lower limbs and energy of Stomach and Spleen Meridians flowing toward the center. When you place your attention somewhere in your body, you can feel that something is happening. Energy is displaced to that area. The Chinese Meridians are channels through which Chi flows, to nourish and energise the body. When this flow is balanced and harmonious, we experience physical and emotional well-being. When the flow is blocked, erratic or depleted, we experience physical or emotional dis-ease. We will work with the Earth Element and energy of grounding and balancing. 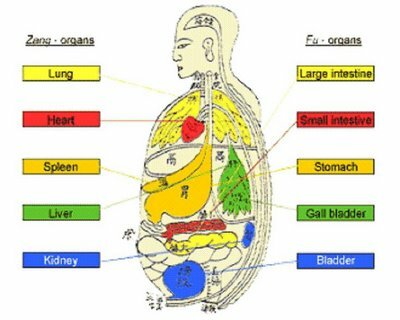 In Chinese anatomy, Earth is represented by the organs of Stomach and Spleen. They build and maintain the entire body: Stomach is where food is prepared for absorption, and Spleen helps absorb nutrients, feeding muscle and blood. The Stomach leg-yang meridian flows from the head down the torso, wrapping the Spleen and along the front of the legs, over the top of the foot to the toes. The Spleen leg-yin meridian flows from the toes along the inner edge of the legs to the torso, encircling the Stomach and coming through the tongue. Please have a bolster, yoga belt, blankets and 2 blocks. We will concentrate on energy of the legs and balancing front and back, inner and outer. Earth is yin, feminine, like Mother Earth, and its direction is the center. In the IChing, its tri-gram is three broken lines showing the earth open and receptive to rain, sun, and all natural forces. The emotion associated with earth is empathy, and other earth qualities are pensiveness, thoughtfulness, and reflection. Earth energy is grounded, nurturing and compassionate, often shown as “earth mother”. Earth needs grounded stability to assimilate and nourish the heart mind. Just as one assimilates nutrients through the stomach, one assimilates life experiences through the element earth. A strong earth element helps to digest and accept fate and balance wisdom with compassion. It is the Harvest Full Moon tonight, with the ending of celebrations for Ganesha Chaturthi, and the beginning of the Mid Autumn Moon Festival. The Chinese and Vietnamese people celebrate this evening to commemorate the dragon bringing rain for the crops. We observe the moon to hold reverence for fertility, with prayers for bountiful harvests. Confucian scholars gazed at the moon, and wrote poetry and song. It is a good day to celebrate the abundance of our lives and give thanks to the illumination of the darkness to light. Please have a 2 blocks, bolster, blankets and a chair to work on poses for Earth to Metal transition, from Spleen to Lung, and from Late Summer to Autumn.